Gaza terrorists switched focus towards midday Sunday and directed their missile barrages towards Ashkelon and the Eshkol district. Gaza terrorists switched their focus by midday Sunday and targeted the southern coastal city of Ashkelon. Several barrages of long-range Grad Katyusha missiles were launched at the city. 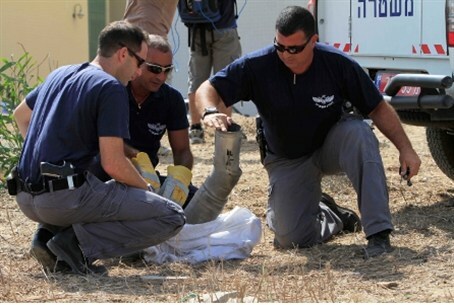 Nine rockets landed in and around the Ashkelon Regional Council district and the city itself during the course of the morning. Three were intercepted by the Iron Dome anti-missile system. One missile hit a building and caused damage to the structure. Another rocket landed in the southern part of the city. In addition to its desalination plant, Ashkelon is home to several strategic facilities as well, making it an inviting target for Gaza terrorists. The Eshkol Regional Council district was peppered with similar rocket attacks as well. In addition, a Grad Katyusha missile exploded in an area between Ashkelon and Be'er Sheva. None of these attacks caused damage or physical injuries. Egyptian television reported that at least two rockets also landed within Egyptian territory, near the city of Rafiah, which straddles the border between Gaza and Egypt and through which terrorists have been able to go from Gaza to Sinai. No one was injured in either of those attacks. At least six missiles were launched towards Be'er Sheva before noon as well, with at least two being intercepted by the Iron Dome anti-missile system. One landed on a school building that was empty due to the summer vacation. Another exploded on a road, and two landed in open areas on the outskirts of the city. No one was physically injured in the attacks.